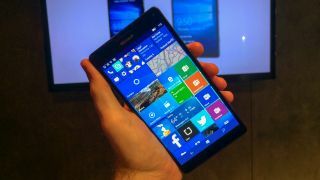 Microsoft has opened pre-orders for the Lumia 950 and Lumia 950 XL so you can get your hands on the first phones boasting the Windows 10 Mobile software. You can head to the Microsoft Store right now and pick up the Lumia 950 for £449.99 and the Lumia 950 XL for £529.99. The Lumia 950 comes with a 5.2-inch display, 20MP camera, 32GB of storage and the new Windows 10 Mobile software. Then there's the Lumia 950 XL, which is similar but includes a 5.7-inch display and is therefore a little bit larger than its sibling phone. If you buy it from the official store it'll be shipping by December 3. There's also the chance to get the Microsoft Display dock through the Lumia Offers app – but be warned it's only while stocks last.